While shopping for new homes in Memphis, you may have come across the term “builder grade”. What this refers to is the type of materials used in the construction of a new home by most builders in the Memphis area. Often times you’ll walk into a model home, look around, and think, “I love this!” And soon you find out, that everything you see is an “upgrade.” Your heart deflates as your budget expands. Here at Magnolia Homes, what you see, is what you get! And there’s a lot you can’t see that will improve the quality of your home and the life you live within these walls. When we build a house we include all the things we would want in a new home. This way, you don’t have to constantly calculate the added features. We call these our value features. These are features that we include already rolled into the price of your home. Many of these features aren’t even available through competing builders in Memphis. If you were to request them, the minimum costs could sky-rocket the price of your home, or simply not be part of their building practices. What once seemed like an amazing deal, is now brought up to our level of standards, but without our level of experience in building a superior home. It’s important to realize that when you are looking at new homes in Memphis, a lot of the value cannot even be seen. The value happens in the construction process and is hidden behind the finishes. While we provide superior finishes as well, what goes on behind the scenes is even more important to us. James Hardie siding and exterior trim reduce termite, rot, and fire concerns while providing a 30-year warranty on siding and a 15-year warranty on trim. The list goes on…and these are the things you can’t see! It’s important to realize as you shop for a new home in the Memphis area that you are not comparing apples to apples as you hop from builder to builder in the area. When it comes to a Magnolia Home you are comparing apples to oranges. Here is a list of each and every one of our value added features and what they would cost if you were to add them on to a standard home you’d find built by other builders in the Memphis area. 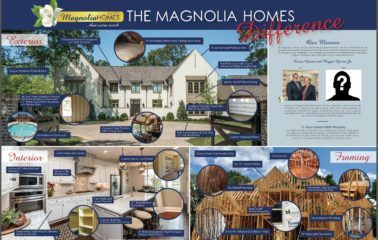 As you can see there are a lot of value added features that go into the making of your Magnolia Home. For more information, check out the Magnolia Difference or contact us for more information.